Hey guys! You remember Lola’s bedroom tour from a couple weeks ago? 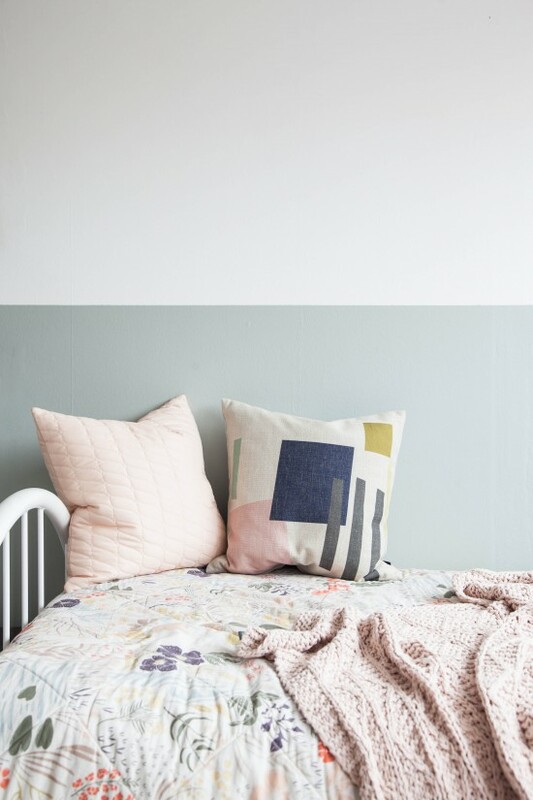 Today I am excited to introduce a brand to you which you may or may not have heard of called FEST Amsterdam, who’s pretty pillows we used in the design of Lola’s room. FEST is a young Dutch interior label that offers pretty pieces for the home from furniture to accessories. Punchy colours and sleek, Nordic inspired designs are what makes this label distinct. Their pillow collection is delightful and today I’m excited to be able to give away the two gorgeous pillows below to one lucky reader! Graphic, textured and whimsical, these pillows are simply to cute to pass up. Love them as much as I do? Scroll down to find out this set could be yours. But first, a little about this fun, young label because if you don’t know about them, you should because not only do they make charming products but their entrepreneurial founder is super inspiring too. FEST Amsterdam was founded and run by Femke Furnée, a young entrepreneur who saw a gap in the interior design market for original, quality and well designed objects for the home while furnishing her own home. In just three years her label has opened a flagship store in Amsterdam, collaborated with various talented designers and sells its products with retailers in several countries worldwide. FEST pride themselves on comfortable, functional, affordable, and beautiful design for the home, creating happy pieces with personality. Bright pops of colour, whimsical patterns, textural fabrics and quality materials made them a natural choice for me when shopping pieces to place in Lola’s bedroom. But this gorgeous set up for grabs would look fabulous in your colourful living or bedroom too! Make sure you leave your email address so we can contact you if you have won! Our winner will be selected at random and will be announced on Monday, 3 October. Good luck! I just found you on pinterest and absolutely adore your photography style! Gorgeous site! Thank you so much, Catryn! I would put them on my rec room sofa. These are perfect for that room because they’re fun, but still reserved and beautiful! These would be so lovely in my bedroom on a little settee! I would love these pillows to go in my new “grown up” living room. I would love these on my new sofa in my brand new living room I will enjoy this december after one year of rebuilding my home! Gorgeous!!! I would also surprise my little girl. She has recently moved into her own room (after sharing a bedroom with mum and dad for 2 years). These would look absolutely gorgeous on my light gray linen duvet in my bedroom – would be the perfect pop to warm up the space! Oh just found your blog recently and it is so beautiful! I would love these for my little girls room, such soft colours! Absolutely adore this website – need more of this in my life! These would look amazing on my dark grey sofa in front of my light grey brick wall. There are 3 boys in the house so I can definately use some pretty cushions. It would be pretty awesome to hear I’ve won these on my birthday October 3rd! Holly & Fest Amsterdam, these pillows are gorgeous and leave it Holly to bring out their very best by combining them with other pops of colour that bring out their whimsical nature. If I won, I would put them in my baby girl’s bedroom, which I’m hoping will one day look as beautiful as Lola’s. Uh, those graphical pillow designs are just gorgeous! They’d directly move on my desk chair to make home office even more comfi and inspiring. Oh so lovely these pillows. I would put them on our vintage sofa. On the bench in my little entryway so that my guests instantly get the cozy vibe when they walk in and sit down to put on/take off their shoes. The entry way is adjacent to the kitchen and the bench also doubles as extra seating when I have people over. I just love the graphic prints and the subtle, complimenting colours of the cushions from FEST Amsterdam. I think they would look amazing in any room really, but personally, my studio could do with brightening up and I truly think that a touch of FEST Amsterdam would inject an explosion of personality to my creative space! Just pinned one of your pics this morning on my pinterestbord for the nursery. So that probably will be the place where the pillows end up. Or maybe on the couch ?. Making decisions when your pregnant is not the easiest thing. But anyhow, i love the pillows! Simply love at first sight! I would love to place them into my guest room/ home office, where I am doing a make over right now. And as you said before: these pillows are simply to cute to pass up! What a beautiful space! Love the leather handles you added to the Stuva. We’re just about to ditch the naptime for my toddler and I would use the pillows to create a cozy spot to look at books and listen to Winne the Pooh. No doubt, i would put them on the bed of my five year old girl too. I have been following you for several years and i am so happy that you finally shared the pictures of this room of your house, often was i ve been thinking when these pictures should come out, especially when i saw all of those others so beautifull rooms. When my Anna saw the pictures, she asked, is this my room? Maybe soon something similar? I would love to place these pillows in a reading nook in my three-year-old daughter’s room. I actually have that Schoolhouse Electric quilt on her bed and those pillows would look oh-so lovely in there!! I would put them on our sofa! Your daugther’s room is gorgeous! Such a cute, little reading nook! Omg this is the most gorgeous room I have ever seen! I need to replicate this for my girls ! I have restyled our bedroom recently. Tones of grey, pink and sand, so these pillows will perfectly fit on our bed. We just needed an extra “touch”, so this give aways comes at the right moment. Thanks for the lovely renovation inspiration on your site / instagram. Hello, can you tell me details (size and name) about the wardrobe and drawer underneath ? The door of the wardrobe is STUVA as well ?